In lecture 2 he opines on symbolic and psychological aspects of the 3rd chakra – Manipura – shown here with a yellow center and red triangle that symbolize fire. 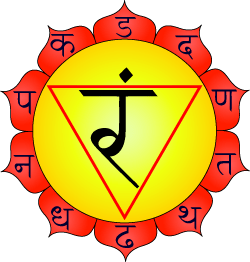 Interestingly, the location of this chakra overlaps with what we, today, call the “solar” plexus – not because of its symbolic connections to the fiery sun – but rather, simply because the neural projections from this plexus, located between the stomach and the spine, radiate outwardly in a sun-like fashion. Jung notes that fire symbolism often follows water symbolism – just as occurs in the chakra hierarchy where the previous chakra is symbolized by water. This ancient pattern of symbolism is common across many religious traditions. So, I guess, after a person emerges from the murky depths of water, the next stage of their spiritual journey or subconscious “awakening” is a time in their lives when they grow to feel connected to something greater than themselves, to something eternal, beyond the everyday world, perhaps cosmic or goldly, etc. Jung suggests that this initial connection to “god” has long been symbolized by the sun and by fire. Furthermore, Jung suggests, there is a shared, underlying psychological reason why so many ancient cultures used the common symbols of fire for this phase of their development. It would seem that for many, that once they let go of the closely-held, relatively petty details of their day-to-day life and acknowledge a connection between themselves and the wider universe and things divine – that, upon letting go – their own fires of passion and emotion become alight. So it is just that – you get into the world of fire, where things become red-hot. After baptism, you get right into hell – that is the enantiodromia. And now comes the paradox of the east: it is also the fullness of jewels. But what is passion, what are emotions? There is the source of fire, there is the fullness of energy. A man who is not on fire is nothing: he is ridiculous, he is two-dimensional. … So when people become acquainted with the unconscious they often get into an extraordinary state – they flare up, they explode, old buried emotions come up, they begin to weep about things which happened forty years ago. I think I can relate to this notion. Perhaps when you accept that you’re just a part of a larger plan, or just a single link in a long continuum, you stop worrying about the petty stuff which then allows your own deeper passions and emotions to flow more freely. Both the good emotions related to creativity and love as well as feelings of sadness and loss that come along with recognizing your fate and limitations – all begin to emerge. These feelings make a person feel more “alive” than they would just playing it safe, workin’ 9-to-5 payin’ the bills etc., etc. and never allowing themselves to embark on their spiritual journey. So it seems, as suggested by Jung, that we begin our spiritual awakening as humans have for thousands of years, by “taking the plunge” and choosing – not the “safe career” path – but a path in life that “means something” to us. From the dark, uncertain waters, we emerge – and then the inner fires begin to burn, to inflame our passions and give us energy, to live and to create. … can’t wait to see what’s in store next! Am really enjoying reading Carl Jung‘s 1932 lectures on The Psychology of Kundalini Yoga edited by Sonu Shamdasani. Jung focuses on the chakra symbols – which have many different biological, physiological and psychological interpretations. To Jung, the chakra symbols reflect a natural psychological process of self-awareness and spiritual development. In the Kundalini Yoga tradition, there begins a “natural awakening” that occurs in life that motivates a person to pursue endeavors that have some sort of personal “meaning” rather than be content with just the basic ordinary existence. I guess we all get tired of just payin’-the-bills, so to speak? Some strange urge underneath forces them to do something which is not just the ordinary thing. This is a common, wonderful aspect of our lives right? Don’t we all hit a point where we want to do something “special” with our lives? I can’t help but think of all the coaches, music teachers, artists, etc. etc., that I’ve met in my life who weren’t happy just payin-the-bills and opted to do something “special” with their time. But there lies some danger in trying to do something “special” ! If we step off the path of the ordinary, practical concerns of daily life to do something unconventional or “for the love of it”, we risk losing the safety and stability of our everyday life. The banker who leaves work early to coach a little league team may put his career at risk. The kid who chooses music as a major instead of accounting similarly trades a staid (boring) future for a more impoverished (but perhaps fulfilling) future. And so on and so on. We’ve all been there. 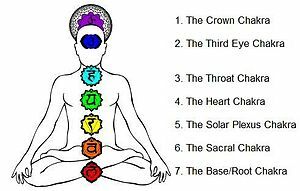 In terms of the chakra symbols, the shift from this lowest, ordinary, root, muladhara stage to the next swadhisthana stage involves a symbolic shift from earth to water. 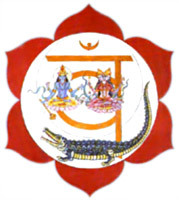 This can be seen in the images on the chakra symbols: a stable elephant in the root chakra and the sea with a leviathan as depicted in the next higher level chakra symbol (shown here). Jung says the shift from “ordinary life” to the pursuit of a “meaningful life” is naturally fraught with psychological fear given the inherent risks, uncertainty and possibility of failure. The way into any higher development leads through water, with the danger of being swallowed by the monster. If you study the beautiful mosaic pictures in the Baptistry of the Orthodox in Ravenna … you see four scenes depicted on the wall: two describe the baptism of Christ in the Jordan; and the fourth is St. Peter drowning in a lake during a storm … Baptism is a symbolic drowning. So perhaps the very first steps in taking on a new “meaningful” direction in life – from simply payin’ the bills to doing something personally fulfilling – is to face the inherent uncertainties and fears. To move into the murky depths and confront the possibility of failure and loss. OK. I will try and ground my sit bones into the water – rather than the earth!